Kids these days. Such strangers to me, what with their Jonas Brothers promise ring cults and their not being old enough to remember when a “bad touch” from Michael Jackson could make you famous. I mean, who are these people? Four-year-old Seth, on the other hand… I can relate to. 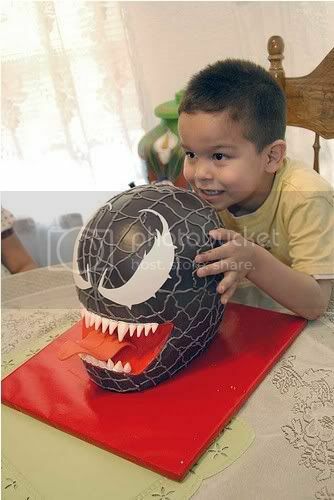 When birthday time rolls around, Seth doesn’t just want a Spider-Man theme cake. He wants a cake whose threatening visage and pointy fondant teeth make you want to fight the cake for its sweet, delicious insides. Because Seth and I both know that nothing tastes better with comic book cake than victory gloat. 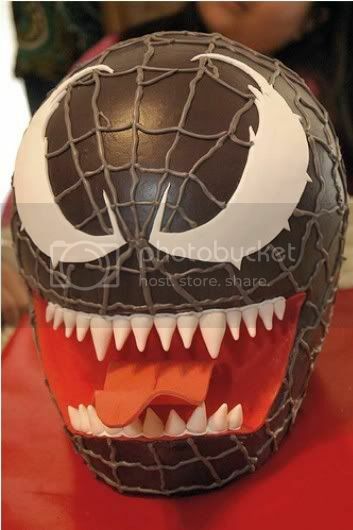 Seth’s aunt Sylvia of chocolate moose cakes was happy to oblige with this cake in the shape of the head of Venom, Spider-Man’s arch-nemesis. It was a chocolate cake with chocolate mousse filling. It was surprisingly easy to make, but very scary to transport (like any other cake, really). [It had] buttercream head and mouth, with fondant teeth, tongue, and eyes. In the photo above, we see Seth presenting Venom’s head on a platter, in a gesture meant to appease millions of fans insulted by the villain-overload in Spider-Man 3. You are wise beyond your years, Seth. Seth dealt the final death blow to Venom’s eye sockets before engaging in the ritualistic Dance of Victory Gloat. Followed by the ceremonial Sugar Spasm of Bouncing Off Walls and the subsequent Nap of Sugar Crash Despair. Thanks to Sylvia of chocolate moose cakes in El Paso, Texas, for the photos and deets. 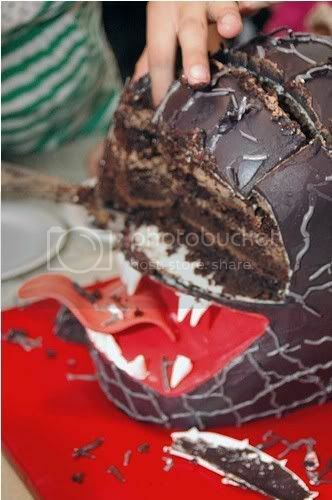 Check out more of her wild cake creations in her Flickr photostream. Jonas Brothers… hah. what D bags. Wow! that looks awesome and the cutting into picture makes the cake look so delicious!